R.E. Nelson was born in Texas and raised in Southern California. He has been writing for as long as he can remember. One of his earliest recollections related to writing is winning an essay contest in sixth grade–something patriotic about the American flag. When he travels, his preference is staying in select areas for an extended period of time and learning about that place. He has lived in both Vietnam (twice, actually) and Saudi Arabia, and also spent time in Egypt, South Korea, Shanghai (his only China visit thus far), and Dubai. Now he is happy to call San Francisco home. And now for something a little different. At each stop, a new question for R. E. Nelson, a broken interview as it were. Our question? Scattered Thoughts and Rogue Words:– What was the last Halloween costume you wore? Nelson’s answer? An Arab thobe – Note: The Thobe is a traditional garment worn throughout the Middle East. In April 1975, as the government in Saigon is falling, Michael Andrews prepares to make his way back to Vietnam to find the love he was forced to leave. But Michael’s journey begins four years earlier. He joins the Air Force to keep out of the Army and out of Vietnam, but his first assignment is teaching English in Saigon to members of the Vietnamese military in an Army program called Palace Dog. As an artist, and a man, before his time in Vietnam, Michael found life lonely and unsatisfying. In the midst of war, Michael searches for direction and meaning. He ultimately finds love and hope with Thao, a young Vietnamese art student, only to have their already uncertain future wrenched from them when he is pulled out of the country. For Michael, his return in 1975 is inevitable and without question, though the outcome he hopes for is anything but assured. The cyclo had bumped across the bridge, following the curve in the road, then moved quickly down the final straight stretch, past houses and shops, past rows of trees and walls and occasional open spaces, past vendors who lined the street’s edge selling gasoline in glass bottles. Motorcycles, Lambretta mini-buses packed with people, cream-and-blue Renault taxis, pedestrians with baskets and boxes—all crowded the street. Noises, smells, and smoke came from everywhere, and as the driver increased his speed, I smiled, gripping the metal frame tighter and pushing slightly with my feet as the moist wind rushed around me. Speeding through the streets of Saigon, wearing the green Air Force-issued jungle fatigues, my life of a year ago seemed unreal. 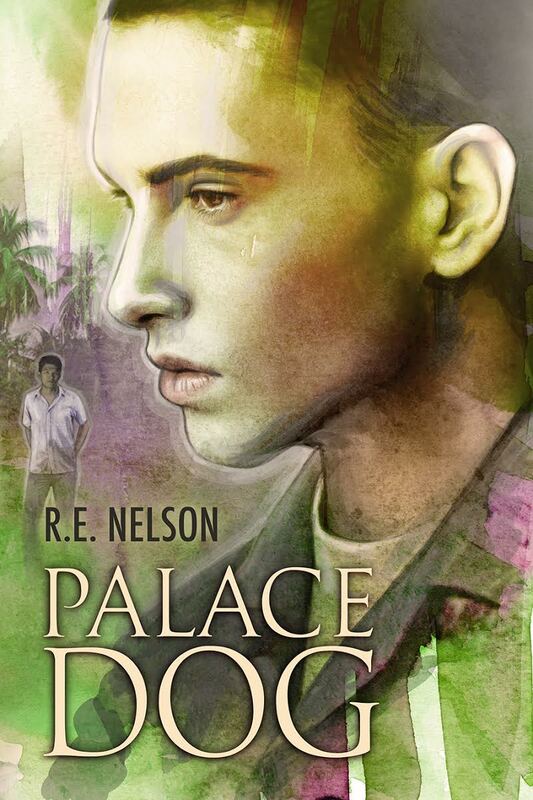 Contest: Enter to win a Rafflecopter Prize: E-copy of ‘Palace Dog’. Must be 18 years of age or older to enter. Prize notifications by Pride Promotions. 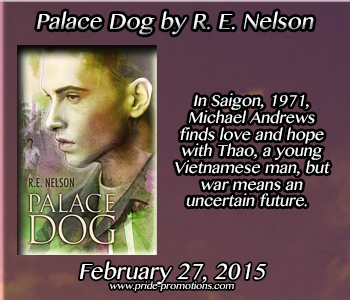 This entry was posted in Book Giveaways, Book Reviews, Book Tours and Contests, Books, Contemporary fiction, Dreamspinner Press, eBooks, Historical, LGBTQ Book Reviews, M/M Book Reviews, M/M Fiction, M/M Romance and tagged M/M Historic romance, m/m multiracial romance, Palace Dog by R. E. Nelson, Saigon setting.